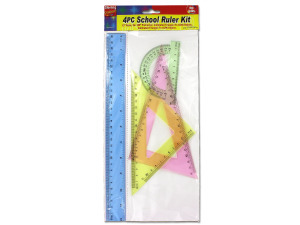 The school ruler kit comes with every style needed making them perfect for learning. Comes with 4 different styles of rulers. 1 standard ruler, 1 60 degree calibrated triangle, 1 90 degree calibrated triangle and 1 protractor. All rulers are packaged in a poly bag with header card.